Welcome to your Friday Edition of the Marketing for Owners Podcast. 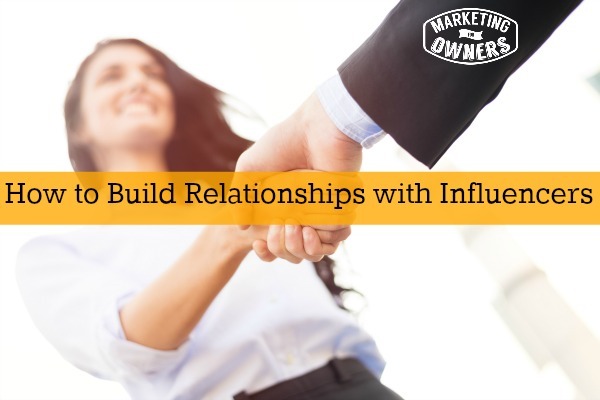 Today I’m going to help you to build relationships with influencers because that is one of the Holy Grails. There are a lot of Holy Grails in my marketing system and that’s one of them. But this is essential and you can try it again but really as first impressions you only get one shot at this with any individual influence. 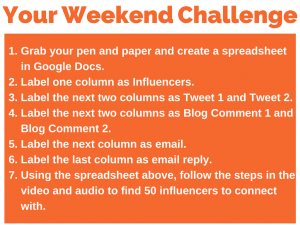 So, first of all, I’m going to give you your weekend challenge and then I’m going to explain how it works. 1. Grab your pen and paper. You’re going to create a spreadsheet preferably in Google Docs, in Google Sheets because it’s online, it’s stored, it’s free, it’s easy to update and you can share and get to it from where ever you are. 2. 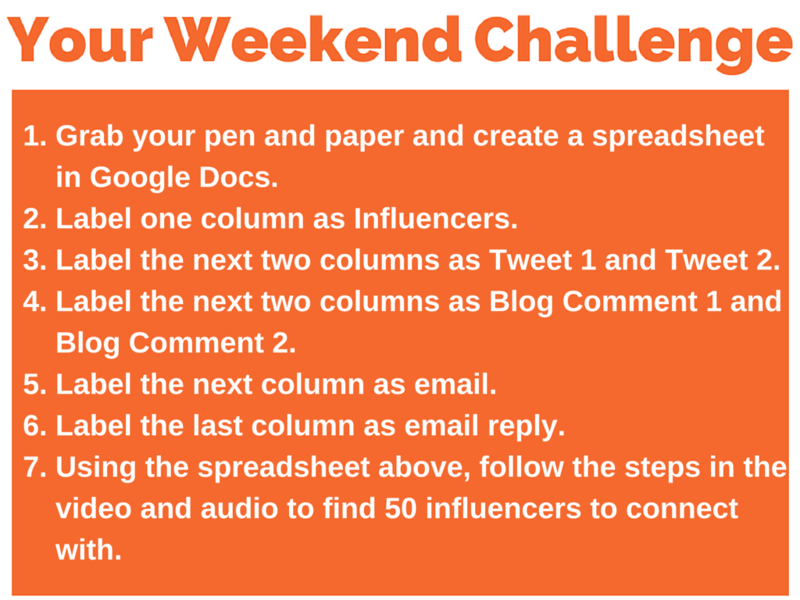 Influencers: On that spreadsheet, you will create a column called Influencers. 4. Blog Comments: You are going to create two more columns, one called Blog Comment 1, the second, Blog Comment 2. Followed by two more columns. The first one is Blog Comment, Blog Post 1, Blog Post 2. Actually call it Blog Post Share. 5. 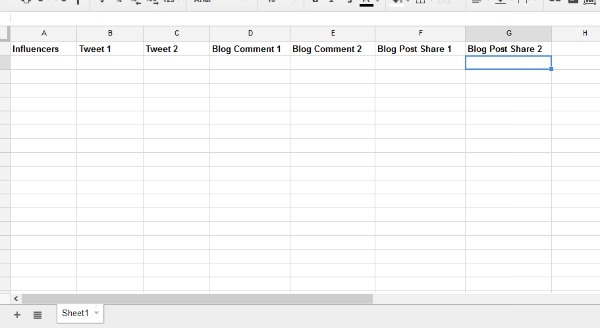 Blog Post Shares: Now you are going to create two columns labeled — Blog Post Share 1, Blog Post Share 2. Might make more sense. 7 Email Reply: The last column you will have is Email Reply. So, you’ve got that? If not, rewind this. Listen to it again or just look in the show notes. Influencers are people who have a following, who are widely respected in your trade, in your atmosphere, in your area who have a larger following than you. You want them to recommend you to their followers. Therefore, you leverage their following and some of them will follow you. So, this takes a bit of work and it doesn’t take that long by the way, but it takes some determination. But this will launch your business. And so the type of influences you want are people that are online. They need to have social media followings and they need to have a blog. It doesn’t matter what type of blog or they can have a forum by the way. It’s a very active blog, very active forum. You should know who is an influence and they can be in a slightly related area. So, better in mind to make friends, marketing forums, teachers, small business kinds of things. So I don’t have to talk to people in marketing. I can talk to people who would advice on business matters. Could be something about banking or something else or insurance or that kind of thing. But preferably you’re going to find fifty of these people. Yes, fifty and you’re going to list them on those influences. And the best thing is to put a link to their blog and to their twitter handle so that you can get to this easy because these are the tools that we’re going to be using. It’s best you might also put their name there as well so you know what, how to spell it properly. Yes, exactly. Don’t get that one wrong. If you can’t come up with fifty, try to come up with twenty or thirty. But the more effort, the better it works. See some of these people will not respond. So the more the better. Influences should have a good Twitter following. And by good it doesn’t mean they have to have half a million followers. They’re not celebrities. They just need a good solid following, that means more than a couple hundred. Okay, a few thousand and they need to be active. Look at the last statement they tweeted to make sure they’re active. So, what you do, tweet one, you look for where they started a conversation, they put out a point that relates to their opinion. Not when they’re sharing someone else’s information. Something that relates to their opinion. Then, you obviously follow them first then you dive in and you comment on that opinion and you agree with them or you say something, something that you mean by the way, don’t make the stuff up. So, you agree with them or you have some kind of comment, but make sure it’s an @ reply to them. Then a little while later look for another one, by little while I mean next day or the day after, look for another one and do it again. Okay, give them insightful information. Now, hopefully, you will now they may reply back to you. But hopefully if they’re active on social media, they’ll be tracking at replies and they’ll notice your name. Next thing, dive into their blog. Read the blog posts. Find one that you agree with or you disagree with and someway and write an excellent comment. Don’t please, just don’t write a great post. We need more than that. Something like that, a proper blog comment and record that in that column like to the list of URL. Hopefully, he will come back or she will come back and reply. If they’re good at this. Don’t forget influences are good at this kind of stuff. So you need to tick the boxes that say email me with replies. But that’s why you keep that link so you can check back to see if they do reply. Now you’re going to do the same again. And if you do this all around the same time, they’re going to see tweets from you. They’re gonna see this, they’re gonna see that. The next thing is you find one their great articles and you share it on your social media channels. Then, link that in the blog share column. And in the comment there, you can comment again and say “I love this. I have just tweeted this to my following because they need to know etc. etc.”. Then find another post. Put that one share on Facebook and maybe it’s a picture of, and again use different comments. Talk as if this is a new friend you’ve made and you just discovered all their things. This will catch their attention if it doesn’t, then perhaps they have too many people that are commenting. But good modern influencers are using social media. They will notice that you can write to them. You can write them an email and say, “I know you get lots of pitches, but this is not a pitch, however. I’ve just written a new report. I’ve just created a new video. I’ve just written a post. Talk about something that you’ve done that is great. This is your chance. They will want to see it and you want them to recommend it to other people. Now, it might be your download report or something like that. Make sure they are going to be impressed. Don’t forget, these people are not Shakespeare. They’re just bloggers, just influencers, just normal people like you that know a lot about your trade. So don’t worry. Don’t think “Oh I can’t impress them I’m not a great writer”. All they need is to have gained something from your, whatever your sense of report. They need to be better informed at the end than they were at the start. They like you don’t forget. You make good comments, they like you and your letter. You’re going to mention about this and you’re gonna say “I would love it. Do you think this is something that your audience would be interested in? If so, would it be okay for me to send you a link”. Do not include and this is essential, do not include the item or link in that first email. You ask permission to send the link. You will be amazed of how many of these if done it right will come back to you and say, “Sure, I’ll have a look”, because they like you. You’ve commented on that post. You’ve told all their followers that you think they’re great. You’ve shared it with your followers. They owe you one. They’re indebted to you and they like you. Remember they’re not thinking “UGH”. They like you. This is why you’re building a relationship. So will they reply and then they say “Yeah, sure”. So, send them the link. Then see what happens. Do not chase them. Do not say “Did you send that?”. Just watch your Google analytics. 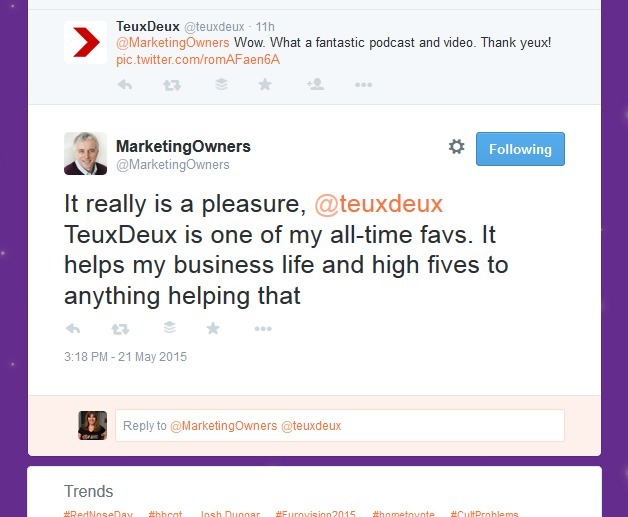 Watch where the referrals come from, look at their Twitter handle, look at their Facebook, see that they do it like. Just get a tweet but you’ll be amazed. Now, once you’ve done that with twenty, thirty, whatever, you will do it some more and you’ll increase that list. There are hundreds of influencers out there. Once you see the success of this, because when they come in, they are going to come to the lead capture, you’re going to get their email, off you go, you’ve got subscribers, etc. This works to build relationships with influences, steal their audience. And have yourself a nice weekend doing it. I’ll see you next week. What influencers would you add to your list?